We have a visitor on the blog today! 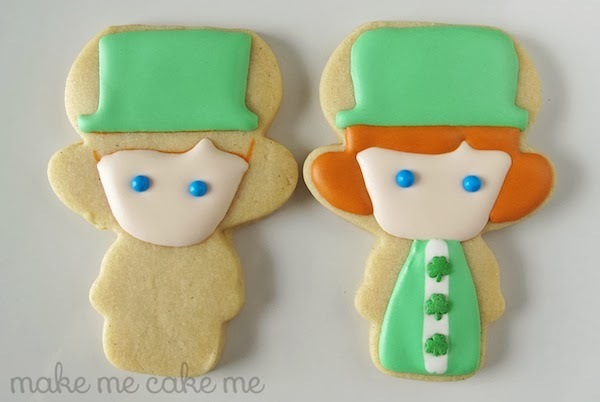 Michelle from Make Me Cake Me is going to hang out here, sharing her Leprechaun Girl Cookies with a full tutorial. Yay! Not only Michelle makes super cute cookies she also shares delicious recipes on her blog. Like this breakfast Lemon Braided Bread or these creative Sun & Sky Baby Shower Cupcakes. Hi Hani’s cookie friends! I’m Michelle from Make Me Cake Me and I’m super stoked to be here! I’ve been a devotee of Haniela’s videos since I first started cookie-ing (my 3 year old’s favorite is the “big big strawberry cookie!“), which makes contributing to her blog incredibly cool! Alright, let’s talk cookies! If you haven’t read my blog before, let me catch you up on a little something I noticed around Christmas. When it comes to the holidays, female characters are grossly under-represented (think Santa, Frosty, Rudolph, Uncle Sam, Cupid) and I’ve set out to balance the scales a bit… well, at least via cookies! I cookied Mrs. Claus over at Sugarbelle’s and not just one set of Elf Girls, but two! 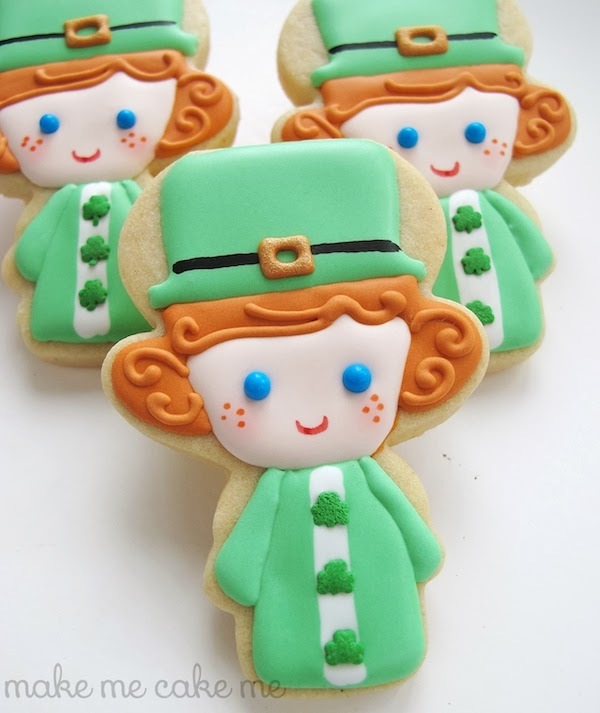 When Valentine’s Day came around, I made the sweetest little Cupid Girl Cookies and now that St. Patrick’s Day is nearly here, the Leprechaun Girls are making their debut! And because I write love letters to my Snowman cutter, I had to use him for these gals. Give him a flip, trim the top flat, and voila! With a few sprinkles and a couple edible markers, these cookies are no big whoop. 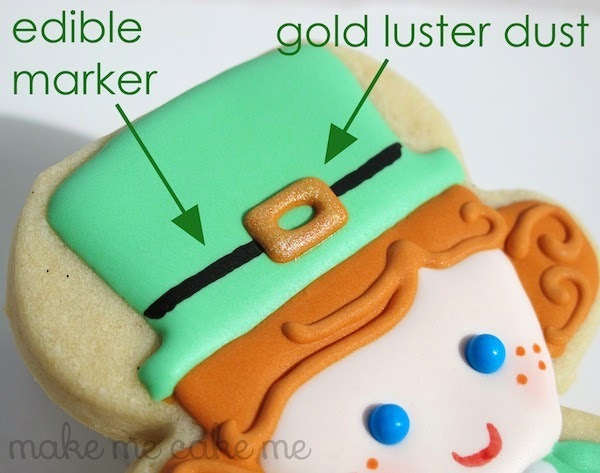 To start, fill Leprechaun Gal’s hat with green icing and her face with flesh tone. While the face is still wet, drop in blue candy beads for eyes. Let the icing set about 20 minutes before filling her hair with auburn icing and her dress with green. 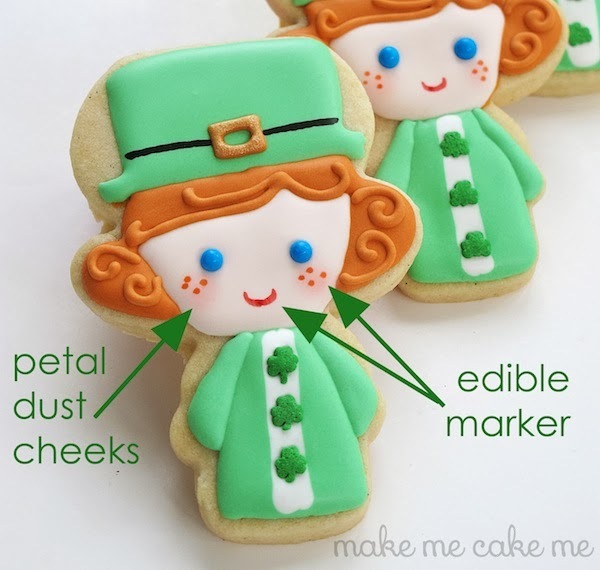 While the green is still wet, pipe a thick white line down the center of her dress and drop in some shamrock sprinkles. Again, let the icing set. 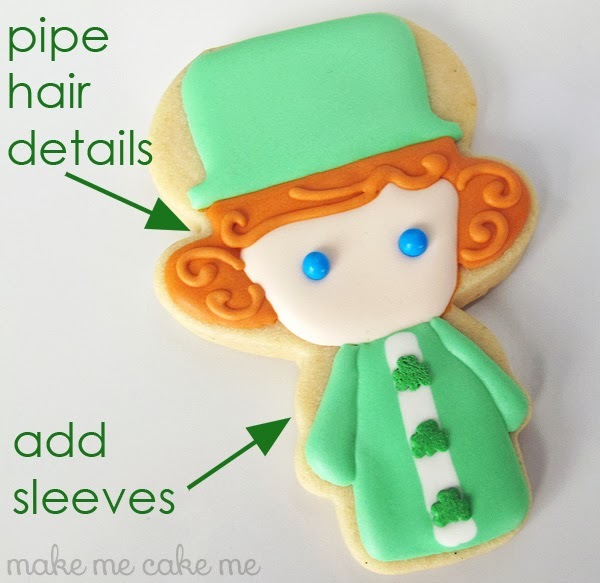 Fill Leprechaun Girl’s arms with green and add some detail in her hair with auburn icing. To get finer lines with 20 second icing, I switch to an itty bitty number 1 tip.Let the cookie fully dry for 8 to 12 hours. Starting with the hat, grab a light colored edible marker and draw a rectangle in the center for the buckle. With a black marker, draw the strap across the hat leaving the middle section between the buckle open. For a visual, check out my Nosey Santa Cookies where I include a step-by-step of this process with Santa’s belt.Use the auburn icing to pipe the buckle. Let the buckle dry fully before painting on a couple coats of gold luster dust mixed with vodka. Using pink petal dust and a q-tip, slowly add a rosey color to Leprechaun Girl’s cheeks.With an orange or flesh marker (I used flesh), add dots for freckles. I tried brown, but found the color too dark. Lastly, draw a smile with red marker. She’s such a cute little gal and I guarantee she has just as much mischievousness in her as her male counterparts!Plus, she’s got that angelic look that will trick ’em all! 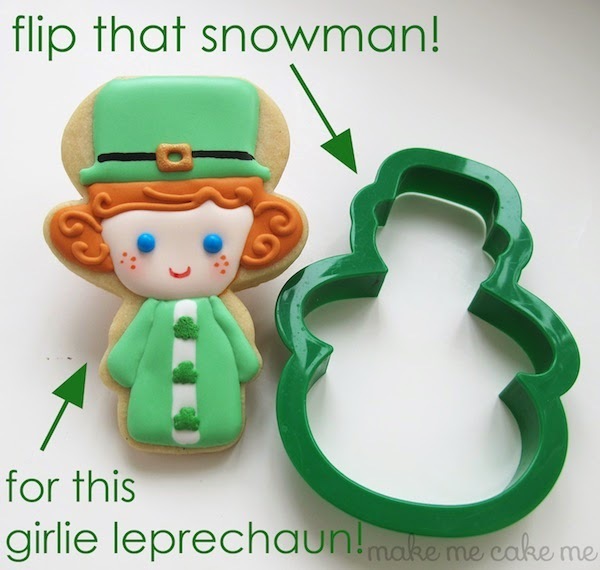 The snowman cutter used to make these leprechaun girl cookies is from my favorite cookie cutter set! I crazy love this Wilton set and it’s way cheap. Scoop it up! Now, was that awesome or what? I absolutely adore these little Leprechaun Girl, fairy girls. She is so cute! 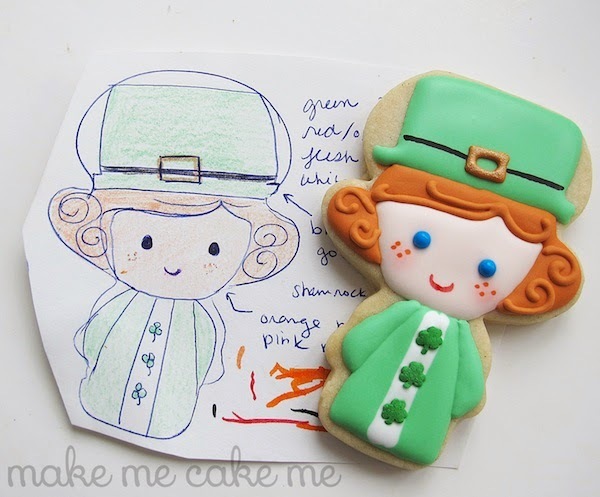 If you’d like to see more fun cookie projects, hop on over to Michelle’s blog Make Me Cake Me.